In the midst of to-do lists, appointments, and shuttling kids here and there it is easy to forget that God will guide us, if we allow Him to. 21 The LORD was going before them in a pillar of cloud by day to lead them on the way, and in a pillar of fire by night to give them light, that they might travel by day and by night. 22 He did not take away the pillar of cloud by day, nor the pillar of fire by night, from before the people. When God delivered the Israelites from Egypt, He guided them by a pillar of cloud by day and a pillar of fire by night. He did not take away the cloud or the fire. He guided them from Egypt to the promised land. Even when the Israelites rebelled and grumbled against Him, God was faithful in guiding them. Just as God guided the Israelites in the Old Testament, He still guides us today. He pours out the gift of the Holy Spirit to guide us and lead us in the right direction. When we walk by the Spirit, we allow the Holy Spirit to guide us in our decisions and our everyday lives. There are times when I feel disconnected and can’t seem to find my way, but when I find that quiet place, I find that the Spirit is still there waiting for me to allow Him to lead. Satan loves to keep us feeling confused and disconnected from God and he will do everything he can to keep us from following the Holy Spirit. I know the Israelites had it easy. All they had to do was follow a cloud and fire. It is difficult to always know where the Spirit is guiding us. We have to be more intentional about finding the time to LISTEN to what the Holy Spirit is telling us. We have to make the time to sit quietly and simply listen to what the Spirit wants us to know. If you are facing a difficult decision, sit quietly and hear what the Holy Spirit tells you about your situation. If you are searching for your purpose, sit quietly and see where the Holy Spirit takes you. God has not abandoned us. He has not left us to wander aimlessly about the Earth. He still loves us as much as ever and He still provides guidance to His children. The Israelites had to make the decision to follow the pillar of cloud and the pillar of fire. We have to make the decision to listen and follow the Holy Spirit. Find that quiet spot, let the worries of the day slip away and open your heart to what the Spirit has to say. The answers you are seeking are already there, you just have to be open to receive them. Prayer is our line of communication with God. This verse tells us to pray continually, telling us to be in constant communication with God. God wants to have an open line of communication with us at every moment of our day. It doesn’t matter what we are dealing with, God is ALWAYS with us and wants us to share EVERYTHING with Him. Centering Prayer– Centering prayer is a way to empty your mind of every day distractions and really focus on God. Centering prayer helps us LISTEN to what God is saying to us. The Daily Examen– The Daily Examen is an Ignatian exercise and is used to examine our daily activities and see where God is speaking to us. Is there any way we could have been a better example of Jesus? Were we impatient when we needed to be kind? The Daily Examen is a way for God to mold our character, as we pray for Him to reveal what we need to change. Prayer Journaling– We can use prayer journaling with the Lord’s Prayer model and as a way to keep track of requests and answers to prayer. Writing out prayers can be helpful in emptying our hearts of worries and anxieties. Often, when I am done writing out everything on my heart, I feel at peace. I know that God is working in the situations involved. Every Hour– Every hour, on the hour, say a prayer about a person, event, or situation that you have promised to pray about. You can also, take the opportunity to praise God and thank God for all that He has done in your life. Pray as the Holy Spirit leads. This is a great way to make sure we pray continually. These are just a few ideas. The internet is full of different ways to enhance our prayer lives. I like to try different methods of prayer to enhance my communication with God. I have found that some things work and some don’t. I try to keep it simple. I don’t want to get to legalistic about my prayer life. There are times when I can’t pray at all. There are times when words fail me and I can only whisper, “Don’t let me go, Jesus.” You will have times like this too. Don’t worry, God knows your heart and has sent the Holy Spirit to intercede for us. 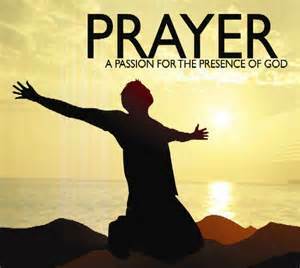 I’m not an expert on prayer, but I do know that I could not live without that open communication with my Creator. I know that at any moment of the day, that I can praise Him or cry out to Him and He will hear me. I encourage you to go to God in prayer. He is waiting for you. If you have any suggestions or prayer methods that work for you, let me know. I’d love to hear from you! 1. The Belt of Truth- Jesus is our role model in living a Christ-centered life. Walk in the truth of Jesus. 2. 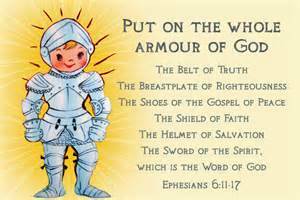 The Breastplate of Righteousness- Do what is right in ALL things. Listen to the whisperings of the Holy Spirit. He is our conscience, sent by God to lead us in doing what is right. If we seek the guidance of the Holy Spirit, we will know what is right. 3. The Shoes of the Gospel of Peace- Walk in peace, living in the peace that God brings into our lives, no matter what the circumstances. Walk out peace, taking peace to the world, so that others may have that peace that you have found. We are to be mediators in the world, bringing peace wherever we go. 4. The Shield of Faith- Protect your heart. Believe that God is real. Believe that God wants nothing but the best for you. He is everywhere, but we must choose to believe. 5. The Helmet of Salvation- Protect your mind. Jesus died to save us from eternal life in Hell. Don’t fall for the lies of the devil. Believe that Jesus died for the sins of the world. 6. The Sword of the Spirit- Dig into the Bible. Immerse yourself in God’s Word, so that you will be able to be victorious in the spiritual battles that we all face. Don’t let Satan win. Hide God’s Word in your heart. Be prepared! This has been a wonderful journey for me. I have learned the importance in preparing daily for the spiritual battles that I face. We never know when Satan will strike, I want to be prepared. I invite you to walk with me as I make a habit of putting on my spiritual armor every morning as I dress. If you have any creative ways of doing this, I would love for you to share them with me. If you need prayer, encouragement, spiritual support, contact me. I am here for you always! Remember my friend, that God loves you and so do I! 11 Now faith is being sure of what we hope for and certain of what we do not see. Faith is believing in something that you can’t see. In my life, I have not seen the physical form of God (none of us could ever withstand the radiance of His presence), but I HAVE seen the manifestation of His presence in the natural wonders of this world, I HAVE seen the outpouring of His love through the obedience of His children, I HAVE seen His provision for those who choose to abide in Him. I have seen enough to know that He IS real and present in my life. If we are tuned in, we can also, feel God through the Holy Spirit. The Holy Spirit is God’s ambassador to this fallen world. I feel God’s presence through the gentle stirrings of the Holy Spirit. I feel comforted by reading the Bible, I feel peace when I pray, I feel encouraged by the whispers of the Holy Spirit, I feel convicted by conscience. It is all the Holy Spirit acting on God’s behalf. We can not see the Holy Spirit. We have to choose to believe. It is a choice. We will never be tuned in enough to feel God’s presence unless we make the decision to believe and to do what we need to do to grow in our relationship with Him. We need to be diligent about growing our faith. We can do this through prayer, Bible study, serving others, and taking up the shield of faith. Medieval soldiers carried shields to protect their main organs: liver, kidneys, lungs, etc. Today I want to focus on the heart. We need to take up the shield of faith every morning to protect our heart from the poison arrows and darts of our enemy, Satan. Satan will stop at nothing to get us to turn away from God. Our hearts are his target. Even we are physically disabled, we can still live joyful lives, as long as our hearts are still connected to God. Satan will pierce our hearts with discouragement, fear, confusion, anger, jealousy, pride, envy, identity issues, hatred, unconfessed sin, and the list goes on. It doesn’t have to be this way. God has provided us with a way to deflect those deadly arrows. Faith in God will send Satan packing. If we hold on to our faith in God, no matter what circumstances we find ourselves in, the arrows of the evil one will not be able to hit their mark. I have been dealing with comparison and jealousy lately. I have found myself jealous over the time my daughter’s in-laws spend with our granddaughter. I have found myself comparing their time with her to my time with her. I know that I have entered the danger zone and that Satan is gleefully waiting for me to sin. I will not sin, because I have taken up my shield of faith and I know that I can not allow this heart issue to cause me to sin. I have to dig into the Bible and dig out the root of this issue before it hardens my heart. I need to be in prayer and believe me I have been. If your heart has been pierced by the poison arrows of Satan, contact me. Let me pray with you and walk with you through this time. You can get through this. My prayers are with you, my friend. God loves you and so do I! A breastplate is an item worn by warriors/soldiers over their torso to protect them from arrows and/or bullets that are fired at them from the enemy. As Christians, we must get in the practice of putting on our breastplate of righteousness every morning to protect our hearts from the arrows of confusion, chaos, sin and negative emotions that Satan fires at us. It is our heart that he aims for, so we must protect our hearts with the breastplate of righteousness. How do we do this? We must know God on an intimate level. God is righteousness. We must learn how to be righteous from Him through His Word, the Bible. Get into the Word. Make a commitment to read the Bible through. You don’t have to read it through in a year. I want you to really study the Bible, looking for hints as to who God really is. I want you to soak in what He is saying to us, His children. I want you to really understand the characteristics of God and build that intimate relationship with Him. We must be open to the Holy Spirit as we go throughout our day. God has used a situation with my 20 year old daughter to open my eyes to how He parents us. This last year has been rough as I try to parent her through some tough times, but through this process, I have felt how much God loves me, even when He may be frustrated with me. He never gives up on me. He deals with me tenderly, with love and patience. Feeling that love, I in turn have dealt with my daughter in the same way. I put on my breastplate of righteousness in this situation. The arrow that Satan meant to cause chaos and heartache, I turned around and used as a growing tool. I didn’t do it alone. God sends the Holy Spirit to guide us, every step of the way. Protect your heart. Be aware that Satan may be using a situation to get you to act in sin. Make the choice to act in righteousness. Ask the Holy Spirit to guide you, giving you the strength to do what is right. Know that you are never alone in this struggle to be righteous, in a sinful world. If you find yourself in need of encouragement, contact me. I am here and I understand. Be Blessed, single mom!